It took me a little over ten days to read Between the World and Me in the summer of 2016. My own world felt like it was crumbling around me and I hesitated for a moment as to whether absorbing such a title would put me in a cationic state. I had just finished Invisible Man, Got the Whole World Watching a day or so before, and the news was swirling with the deaths of Alton Sterling and Philando Castile at the hands of their local police departments. Keeping me from taking my kids anywhere, I was driving less and less as we became more inundated with the images of dead black men and women. As I look back on that summer and those two books, I can remember myself in a mess of tissues and blankets, hidden from the world. But I did read it. And I told people about it. And I recommended it to people. Because when you find something so real and moving and painful, you can't help but want the other people in your life to feel those very real feelings too. People told me to take a break from reading or the blog, thinking that if you don't see it, it goes away. That is not the case and I wanted people to see that you can't just look away because you don't know what to do. So I kept reading and at the end of those ten days, I felt relief. Ta-Nehisi Coates is best known for this publication, but he is a regular contributor for The Atlantic where he writes social commentaries on race and the larger culture. His childhood of growing up in Baltimore, MD is well-documented in Between the World and Me, and he is not shy to note how his education is mostly the work of his own persistence after participating in a failed education system. In 2008 he published his first memoir, The Beautiful Struggle: A Father, Two Sons and an Unlikely Road to Manhood, about his childhood and the relationship he has with his father. His follow-up, Between the World and Me (2015) is collection of essays to his young son about the realities of being a Black father, a look into his past as a child and young adult, and haze of racism that we all live in. Although its overall theme is how we as Black parents cannot save our Black children, it touches upon a number of ideas, from travel to religion to the undying love of one's child. What began as a way to prepare his son for the world around him became this beautiful account of struggle and silent rage. The writing is prolific from start to finish. He immerses you into his past, his world, and wraps his emotions around you like a blanket. He speaks with a gentleness that I felt was more powerful than the yelling and screaming of other writers. He defined racism for us as early as page seven, then litters every page after with examples from his life. He was able to seamlessly navigate between the historical origins of racism and their modern effects within the framework of American (and sometimes global) societies and policies. If there is any concern I have for the praise and accolades his work has gotten, it would be that it meets the rags-to-riches narrative that defines Black success, and that his singular story bears the weight of all Blackness in America. That the eloquence he uses to speak to injustice deters change because of how eloquent it is. I am in complete agreement that this book deserves all the awards, but I find that it does not spur people into action. His critique of racism is reflected in the largely white audience that reads his work and it leaves them paralyzed. I assume it’s because it appears to be a hopeless endeavor to change. 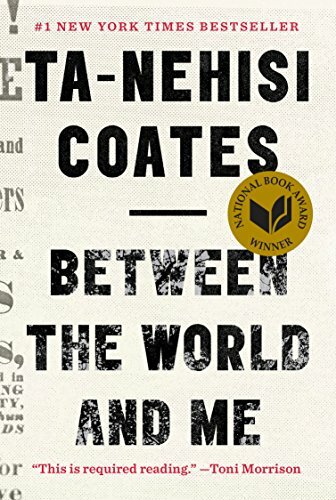 Coates is not optimistic that things will ever get better and this book is not filled with his suggestions on how to fix things. It is a mirror held up to white society to show that they would rather devour Black people than let us live freely among them. Did his work help me out of my own paralyzing fear? I don't think so; but it gave me a narrative to recommend when I needed an example of American polices used against Black American bodies. To me, Ta-Nehisi Coates remains one of the most prolific writers alive today. This book is one everyone recommends because of how deep and moving it is. It's on numerous lists of how to be a better activist or understand people who are different than you. I agree with it all. I finished it in less than two weeks with two small children and I would highly recommend it to you. Did you "like" this post? Comment below and tell me your thoughts on this must read book.